Earth 2150 Trilogy Game Review - Download and Play Free Version! 3 Classic RTS Games in One Package! During the 21st century, science was supposed to rid Earth of the suffering of all the previous centuries. That didn't happen. Instead, an Earth-wide war shook the planet to its core and created unimaginable, irreparable devastation. Follow the three factions that started the war as they fight on Earth, the moon and even Mars. Enjoy more than 200 hours of exciting gameplay as you play through all three titles of Earth 2150 Trilogy: Escape from the Blue Planet, The Moon Project and Lost Souls. Follow along as the tale of humanity's future unfolds and the fate of more than one planet is decided. All three titles are packed with real-time strategy battles. Command your units and build up your base to overcome your foes and gain victory for your faction. Use your mouse to issue commands and change your view to fully enjoy the fascinating 3D environments. Gain control of precious mine fields and make sure you have enough solar panels and batteries to keep things running smoothly as you search out enemy forces and crush them. How the Earth 2150 series differs from other games in this genre is the depth of control the player has over their faction. There are tons of research branches to explore and you can upgrade just about everything, including vehicles, weapons, ammo, or defensive capabilities. Design your own military units and take advantage of the unique scripting features that allow you to record your units' movements and orders for later use. With the variety of actions and avenues you can explore, the Earth 2150 series provides a way for every player to enjoy their own gaming style while utilizing each faction's advantages. The extensive single player campaigns are sure to give you hours upon hours of play, but the multiplayer modes mean you can play this game almost endlessly. The multiplayer mode really shines, especially in the last installment, Lost Souls. There are dozens of maps to explore and scenarios to experience, such as destroying all structures or tech wars. You can mine for resources the old-fashioned way or just start out with some cash and get a set amount at certain time intervals, which is great if you just want to get to the fighting. If you are a fan of the series or you enjoy compelling real-time strategy games, download the Earth 2150 Trilogy and experience hours of fun! The Earth 2150 Trilogy is a collection of addictive 3-D real-time strategy titles containing the spectacular original Earth 2150: Escape from the Blue Planet and its two expansion packs The Moon Project, and Lost Souls. 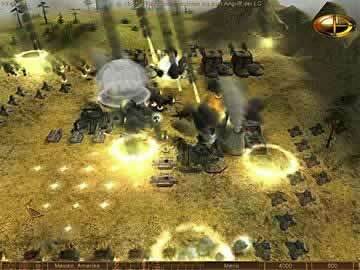 The 3-D elements of the game are very well done and allow you to easily zoom and rotate around the map as you do the usual RTS gaming, such as collecting resources, building up your base, training units, and destroying your foes. The three factions you can take command of are both varied in their technology and units as well as being pretty well balanced. Whether you are taking advantage of the highly advanced Lunar Corporation, the robotic forces of the United Civilized States, or the Eurasian Dynasty's 20th century based tanks and helicopters, the flexibility in strategy and research avenues allow you to play to your own style and preference. This is seen nowhere better than with the designer where you can create units as you unlock upgrades and new weapons by mix and matching various chassis with mounted equipment like cannons, machine guns, lasers, and repair mechanisms. Another rather unique feature to the main campaign is the addition of a protected main base where you can build up your forces with impunity from the enemy. You can then send these forces out into the missions and conversely salvage unused resources and surviving units at the end of missions. This intriguing gameplay element puts a whole new spin on resource management and overarching campaign goals. There are a few slight issues with the Earth 2150 Trilogy that could put off some players. For one while the graphics are pretty good, it can be a little difficult to differentiate between units at times, especially with some of the environmental effects like fog or snow, and this can be frustrating during heavy firefights. 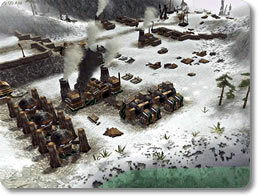 Also, the interface can be a little daunting to players who are new to the RTS genre even with the tutorials and tips. While this can be a little frustrating, it generally pales in comparison to the overall fun and addictive gameplay. Earth 2150 Trilogy provides a rather fun and well done 3-D RTS experience. The flexibility in gameplay and controls allow you to customize your gameplay to fit your own style and preference. The various gameplay modes including the lengthy campaign, robust skirmish, and varied mutliplayer means there are hours of gameplay to be found within each of the titles contained in this trilogy. Watch some of the gameplay that you can enjoy with the Earth 2150 Trilogy.